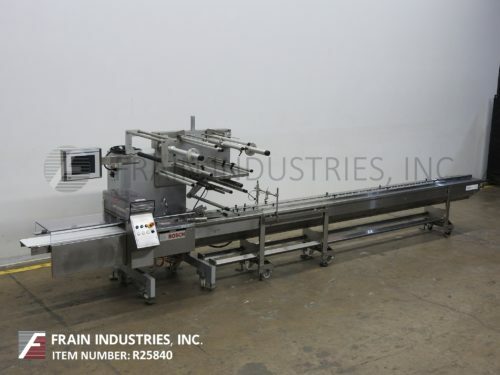 Doboy Model Stratus, 2-up, horizontal, hand load wrapper rated from 20 to 110 products per minute – depending on materials and application. and operator dexterity, Package size range: 3" to 7-1/4" in Length; 1/2" to 6-1/4" in Width; up to 2-1/4” in Height. Equipped with 60" long lugged product in feed, with 1/2 high plastic pop-out lugs, currently set on 6" centers. 7" long x 1" wide 2-up seal jaws, and bottom fin seal wheels, safety guarding and 9" wide x 28" long discharge conveyor. Film specifications: up to 18-1/2" in width; up to 16" in diameter; with 1-1/2" core. Control panel has touch pad controls with readout, temperature controllers with start, stop, and e-stop controls Mounted on base frame with locking casters.